Do you tend to choose the same drink when you go to a party, or out to dinner? I know I do. But, it’s funny how that drink tends to change depending on the season, or even on the place and situation you’re in. Like, if my husband and I go out for a nice dinner, then a glass of wine is what I’m in the mood for. If we go to our neighborhood pub to sing karaoke, then beer is usually the drink of choice. It’s usually around the holidays that I like to go out of my comfort zone and try a unique cocktail. 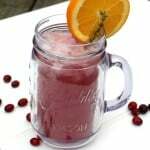 I scanned Pinterest for a perfect holiday cocktail to write about! Many of them were apple flavored and I’m not a big fan of the flavor of apple and alcohol together. A lot of the drink ideas were almost dessert-like, which are probably delicious but we eat enough during the holidays – we don’t need a milkshake cocktail to wash it all down! And then I found it! In my opinion, the PERFECT holiday cocktail! 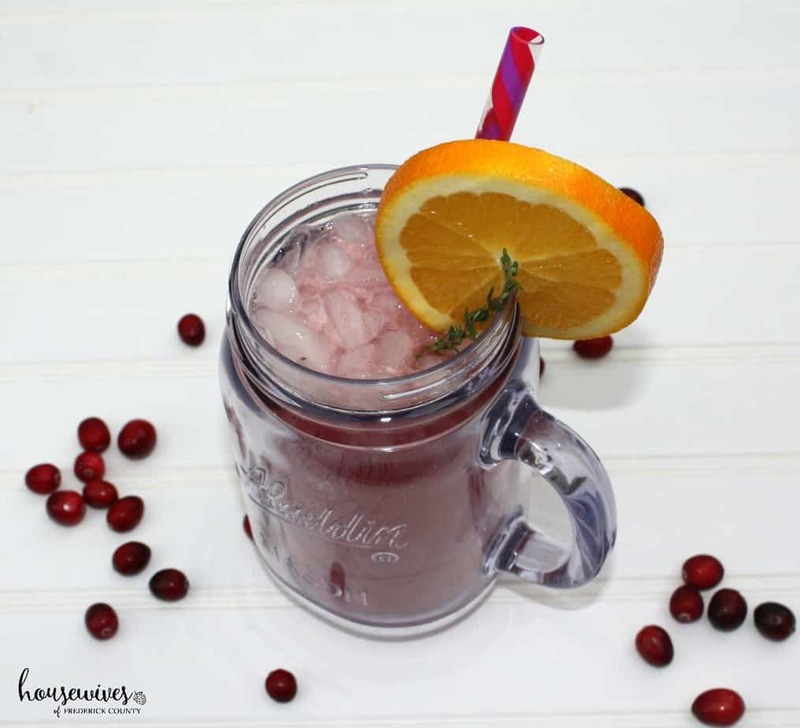 A Cranberry Orange Gin Fizz with Thyme! OneSweetMess.com is the great site I found it on! I did change it up just a bit – I used plain gingerale instead of Cranberry flavored Sprite because I didn’t want it to be too sweet. Of course, if you like it a little sweeter then use Cranberry Sprite! 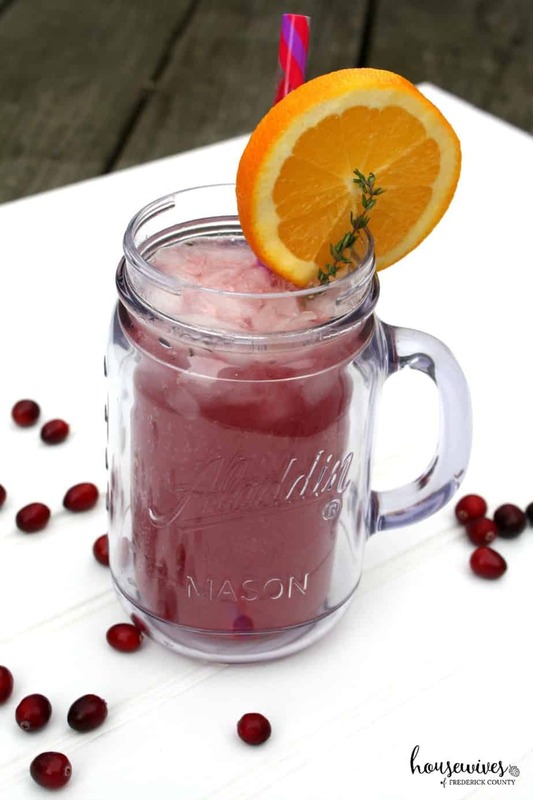 Add cranberry juice, orange juice, and a handful of crushed ice to the cocktail shaker. Give the mixture a few good shakes. Pour into preferred glass and top with gingerale. This recipe brought to you by Housewives of Frederick County! In the recipe it says to “muddle the thyme” – I had to Google that! What that means is you need to press it and crush it so you can bring out the flavor of it. Evidently there are official bar tools that are specifically for this! It’s called a muddling tool or cocktail muddler. You can find them on Amazon! I don’t have one, so I just used the handle of my ice cream scooper. 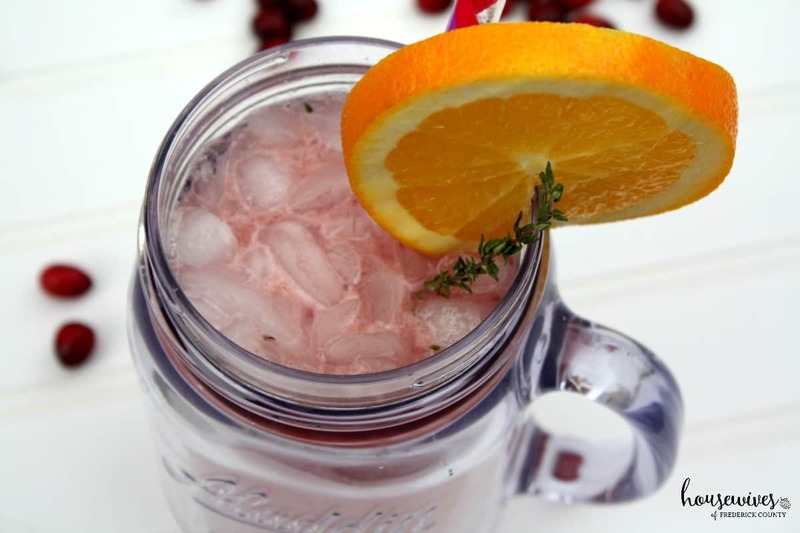 This Cranberry Orange Gin Fizz with Thyme is really delicious! It’s light, and has such a great combination of flavors. To me, a gin fizz is the ideal cocktail of choice for the upcoming holidays! Do you have a favorite cocktail for the holidays? Do you enjoy drinking gin fizz? It goes without saying (but I’m going to say it anyway), please drink responsibly! And, enjoy your families and friends this holiday season!